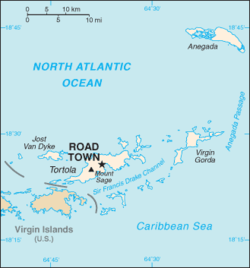 Road Town, on Tortola, is the capital of the British Virgin Islands. It is next to the horseshoe-shaped Road Harbour in the centre of the island's south coast. About 9,400 people lived there in 2004. The name comes from sailing. "The roads" means a place less sheltered than a harbor but where ships stop. Its marina made Road Town a popular place in the Caribbean for chartering yachts. Cruise ships often dock here. Road Town also has tourism. The Harbour is the dock for many of the ferries servicing the island. The ferry terminal is at the southwest end of Road Town. Ferries run during the day every day of the week. A 28 hectare (70 acre) development called Wickham's Cay, is on two areas of man-made land. The HM Prison on Main Street is the oldest building in Road Town. It was built in the 1840s. People disagree about where the borders of the town are. The Emancipation Proclamation was read on 1 August 1834. This gave slaves their freedom, even though slavery had been officially abolished in 1807. In 1853, a fire destroyed nearly every building in Road Town. Angry rioters spread the fire to protest an increase on the cattle tax. Rioters burned most of the plantations across the island.